Over the past four decades advances in the interventional cardiology field have led to growing indications for percutaneous coronary interventions (PCIs). With increasing numbers of complex and high-risk PCIs performed in today’s catheterization laboratories, cardiogenic shock is encountered more frequently than ever before emphasizing the need for proper knowledge of different adjunct hemodynamic support devices available on the market. 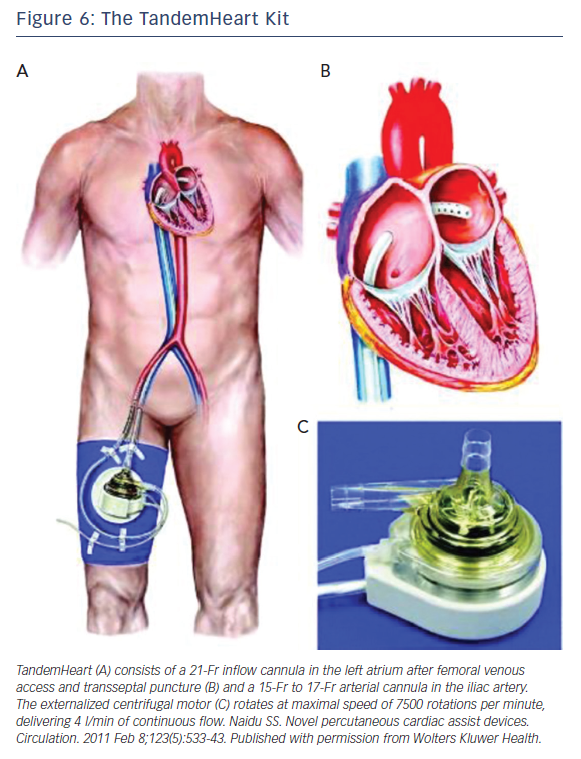 We aim to review the percutaneously-placed left ventricular assisting devices available to catheterization laboratories in the US for use in high-risk PCIs, their indications, contraindications, limitations, and review of the most prominent literature. We aim to review adjunct catheterization laboratory devices that support the left ventricular (LV) while undergoing high-risk PCI. Percutaneous LV assisting devices (pLVAD) include: the intra-aortic balloon pump (IABP), the Impella® (Abiomed, Inc), the TandemHeart™ (Cardiac Assist, Inc), the currently investigational HeartMate PHP™ (St Jude Medical) and extracorporeal membrane oxygenation (ECMO). The advancements of each of these devices have helped support patients’ weakened hearts, preparing them for the road to recovery. High mortality and morbidity are closely related to cardiogenic shock following a MI.4–5 However, these tools are critical to the support of thousands of patients each year, allowing many to move on to new therapy or even surgery. 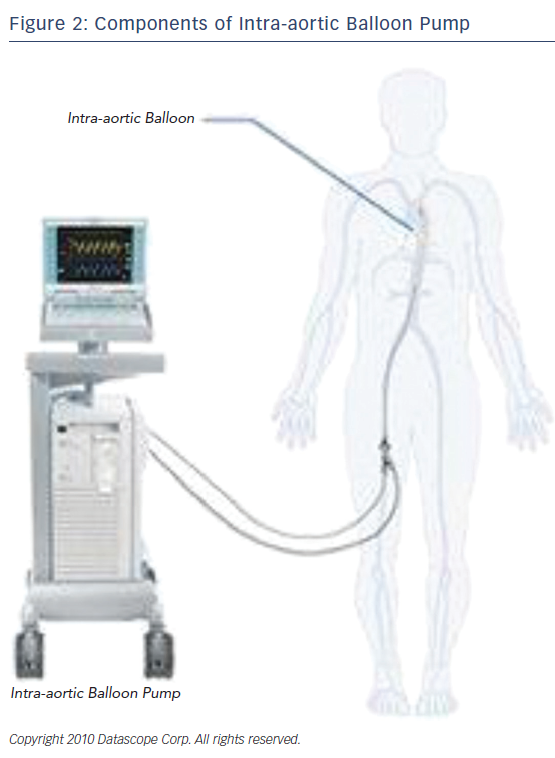 Among the different approaches to the treatment of a failing heart, the intraaortic balloon pump is a frequently used mechanism in medicine today; however, it is an older device in this field of medical technology. It utilizes the idea of counterpulsation, the timing of pressure events to enhance the hemodynamics of the heart. Acting as a circulatory support device, the IABP leads to diastolic augmentation during inflation and potentially contributes to coronary, cerebral, and systemic circulation (Figure 1). In 1967, the first clinical application of an IABP was successfully used on 45-yead-old women that had sustained a MI. By 1976, more than 5,000 patients had received IABP treatment in the US.6,7 Continuous evolution of the IABP led to the development of a percutaneous means of insertion. The adoption of this revolutionary method transformed the field of IABP helping more patients who are unresponsive to other forms of medical management. Despite the widespread use of the IABP, there are still numerous complications that can arise from the use of this device. Ranging from a mechanical error to anatomical risk factors. Cao et al. analyzes some of these risk factors in a study observing the deaths of patients with AMI with IABP support.8 The study consisted of 572 IABP-supported patients with AMI in 72 hours. There were 81 non-survivors and 491 survivors in the study. 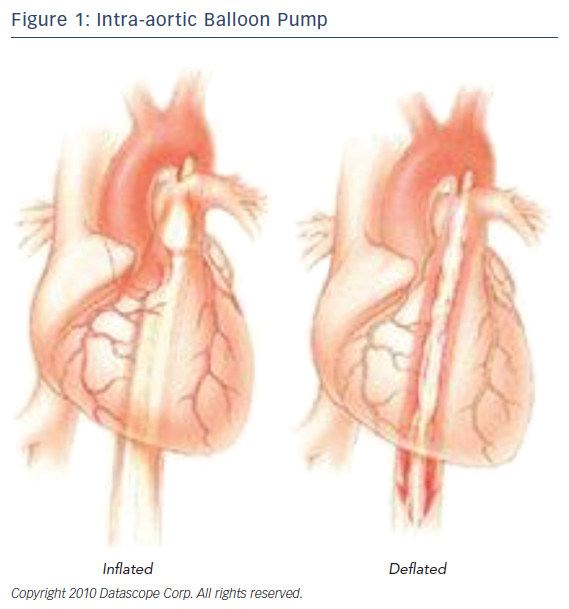 The most prevalent complication arose from misplaced balloon catheters. Peripheral vascular disease, small size patients, use of sheath of IABP, and diabetes can all lead to difficulty of insertion and mispositioning. A mispositioned pump can augment the blood pressure incorrectly, impair the blood flow of the patient, and lead to infection. The acceptance of less-ideal placement of the balloon was indicative of the morbidity of the patient in most cases.9 The primary complication is arterial damage from the catheter; however, ischemia of the limbs, thrombosis, renal failure, balloon leaks, vessel perforations, and bleeding are all possible complications that can arise. A well-validated risk prediction score for short-term mortality in cardiogenic shock patients was developed from Intra-aortic Balloon Pump in Cardiogenic Shock (IABP-SHOCK II) trial.13 The score includes six variables: age >73, history of stroke, glucose >191 mg/dl (10.6 mmol/l) on admission, creatinine >1.5 mg/dl (132.6 μmol/l), thrombolysis in myocardial infarction, flow grade <2 after PCI, and lactic acid >5.0 mmol/l on admission. Each variable is assigned 1 or 2 points resulting in three risk categories with a maximum possible score of 9. Low-risk score of <2, intermediate score of 3–4, and a high-risk score of 5–9 correlated with 30-day mortality of 28.0 %, 49.2 % and 76.6 %, respectively (p<0.0001). In 1966 the first successful implantation of ventricular-assisting device was performed on a 37-year-old woman by Dr Michael E DeBakey.14 The external circuit could support this patient for 10 days following the operation. This marked the beginning of numerous advancements to the field of ventricular-assist devices. In 1988, Texas Heart Institute introduced “Hemopump”,15 the first small, percutaneously-inserted axial-flow pump via femoral cut-down. The device was not successful commercially; however, it was the precursor to today’s Impella. The independency from cardiac rhythm gives the Impella advantage over the IABP; however, the need for experience in positioning and troubleshooting of a relatively new device continue to be a major disadvantage of the Impella. After proving safe and potentially efficacious for use in patients undergoing high-risk PCI in A Prospective Feasibility Trial Investigating the Use of the Impella Recover LP 2.5 System in Patients Undergoing High Risk PCI (PROTECT I) trial,17 FDA approved in 2008 the use of Impella 2.5L for partial circulatory support for periods up to 6 hours during cardiac procedures. Despite failure of the Impella to prove superiority in large multicenter trials as a protective measure in high-risk PCI, several substudies and subanalysis from PROTECT II and registry data suggest more promising results. In conclusion, Impella use as a protective measure in high-risk PCI has shown to be non-inferior to IABP in PROTECT II trial. However, more recent substudies and subanalysis of PROTECT II trial, and registries USpella, and cVAD, are showing better outcomes, lower incidence of AKI even in CKD patients, fewer post-procedure MIs, and fewer need for revascularizations. 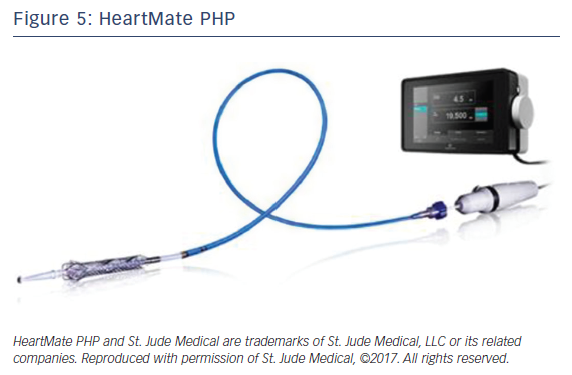 HeartMate PHP is a new percutaneous temporary LV support device manufactured by St Jude Medical currently under investigational use in the US. The device is a low-profile catheter-based heart pump similar to Impella promising to deliver higher blood flow with smaller size compared with Impella. HeartMate PHP catheter (Figure 5) is inserted over a guide wire through femoral access via a 14 Fr femoral introducer sheath. Once in position across the aortic valve, the outer 14 Fr sheath is pulled back allowing for the 13 Fr cannula to expand to 24 Fr. The cannula has an integrated 3-blade impeller that begins to spin pulling blood from left ventricle into the ascending aorta with physiologic flow rate of 4-5 l/min. Introducing the sheath forward again will collapse the expanded cannula for easy retrieval. 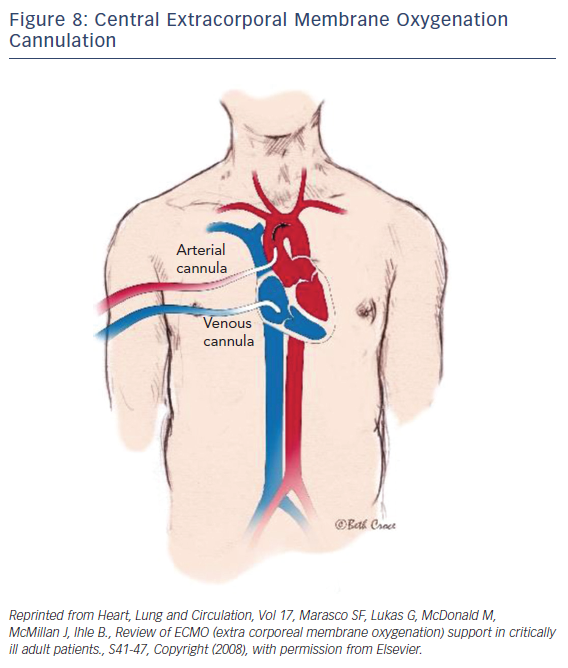 The trans-septal cannula is introduced via venous access into the right atrium then across the inter-atrium septum positioning the tip of the cannula into the left atrium to pull oxygenated blood to the extracorporeal pump. The outflow arterial line is placed through femoral line and introduced to the level of aortic bifurcation providing blood at a rate of 3.5 to 5.0 l/min (depending on the size of the outflow arterial line), resulting in reduction in LV preload, LV workload, filling pressures, and myocardial oxygen demand, and increasing arterial blood pressure and cardiac output (CO). TandemHeart function is largely dependent on right ventricular function to maintain left atrial volume. As with Impella, contraindications include severe peripheral vascular disease, profound coagulopathy, bleeding diathesis precluding safe arterial cannulization, major ventricular septal defect, severe aortic insufficiency and left atrial thrombus. The most common complications from TandemHeart use are limb ischemia and major bleeding. ECMO is a device that externally circulates a patient’s blood providing efficient gas exchange, allowing it to stabilize patients temporarily with heart or pulmonary failure using a semipermeable membrane technology that was first discovered in 1944 by Kloff and Berk.34 Typically, a surgeon would handle the implementation of central ECMO via open approach and peripheral ECMO via a cut-down (Figures 7 and 8). With early technologies, a caretaker could provide a few hours of circulation before hemolysis set in. This barred its use for long-term use; however, in the 1950s the first membrane oxygenator35 was permitted for prolonged cardio pulmonary bypass.35 In the 1960s and 1970s the National Heart, Lung, and Blood Institute organized a nine-hospital collaborative study36 to investigate ECMO therapy; however, errors in the study itself led to inconclusive evidence regarding the improvement of survival rates. Studies during this time reported a 90 % mortality rate with patients afflicted with respiratory failure. After vast technological advancements, ECMO therapy developed enough to improve survival rates up to 75 % in adults with cardiac failure.37 From the 1980s to the early 2000s there was very limited ECMO use due to poor outcomes from prospective studies. Since the early 2000s after much development and analysis there was an increase of ECMO use, utilizing its capabilities as a bridge to transplant or different therapies. After dramatic evolutionary advancements to the technology, the promising outcomes of Efficacy and Economic Assessment of Conventional Ventilatory Support Versus Extracorporeal Membrane Oxygenation for Severe Adult Respiratory Failure (CESAR) trial38 and the role ECMO played in influenza A pandemic,39–40 it became one of the most effective forms of circulatory support. Driven by a rotor unit, the device will drain and return a patient’s blood through a cannula and tubbing. Once the blood is drained, the blood passes through the ECMO device where it is then oxygenated, decarboxylated, and warmed so it can then be returned into the patient. The standard technique of nonsurgical application in adults begins with the peripheral cannulation of the femoral or jugular vessels. The veno-venous ECMO drains and returns blood from the right atrium (Figure 8). Typically, this technique is performed on patients with respiratory distress syndrome. 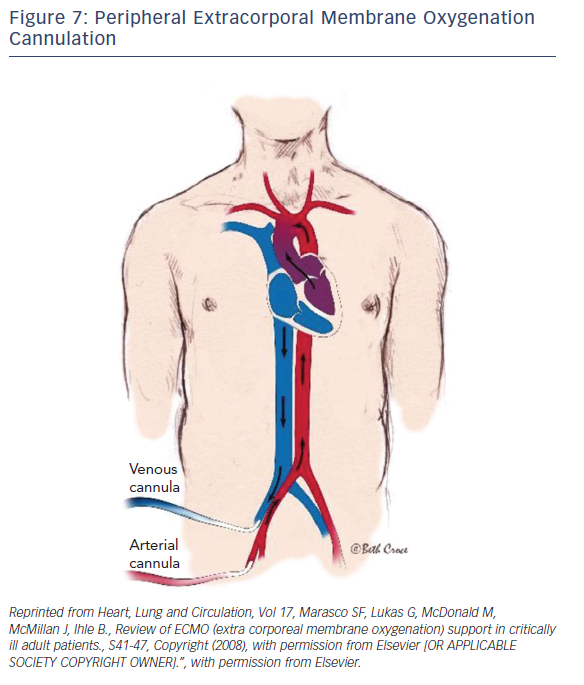 The focus of this paper will be directed towards the veno-arterial (VA) ECMO, which drains blood from the right atrium and returns to the arterial system. The VA-ECMO can reduce the preload of blood and increase aortic flow and end-organ perfusion. Typically, during this treatment, a sheath for antegrade perfusion of the cannulated leg is invoked to prevent leg ischemia. One advantage of this treatment is that the system and technology required is very accessible and mobile, if necessary. Once the device is implanted and operational, the patient can be transported anywhere with the whole unit. The ECMO can establish a right-to-left shunt by draining blood from a vein while returning it to the iliac artery. With large cannulas and rotors, the blood can flow up to 7 l/m, resulting in a significant increase of blood pressure if there is enough vascular resistance (pressure = flow × resistance). Although this device has an extensive variety of benefits and advantages, as is the case with any medical device, complications can arise. Typically, ECMO is used in patients with compromised ventilation or oxygenation status. If they have suffered a cardiac event such as a MI followed by cardiogenic shock, then implementation of the ECMO may also be used. Usage of the device is also common in cases where there is acute respiratory distress syndrome, viral, bacterial, or atypical pneumonia, barotrauma, and acute chronic interstitial pneumonitis.44 Before the device is used, it should be noted that patients with lifeshortening conditions, such as overwhelming sepsis, non-pulmonary multiorgan failure, irreversible neurological injury, terminal illness, or other life-limiting disease, should not have the ECMO device used. A common candidate for the ECMO may also have hypercapnic, hypoxic, and be unresponsive to optimal medical managements, including lowtidal volumes, bronchodilator treatment, administration of epoprostenol, paralytics administration, and appropriate diuresis.45 Clinical studies show evidence of the effectiveness of this device, depending on proper preprocedural assessments. Several recent studies pertaining to the ECMO shed some healthy light on the effectiveness of the device and its patients’ outcomes and treatment. In a recent study from the Journal of Cardiac Surgery,46 over 8 years of clinical observations 150 patients were categorized in four groups by specific indications: patients with post-cardiotomy, cardiogenic shock, requiring cardiopulmonary resuscitation (CPR), cardiogenic shock not requiring CPR, and respiratory failure. Among the 150 cases, 73 (41 %) were weaned off ECMO, 40 (23 %) were bridged to their healthcare goal of transplantation or mechanical-assist device insertion, and 63 (36 %) expired on ECMO. Mortality rates and length of stay in the hospital did not vary much between the four groups. The device duration was 4.9 days on average and the stay in the hospital was 40.3 days on average. With a survival rate of 64 % and a relatively small study population, further data to elaborate on the effectiveness of the device can be seen in another study from the Journal of Critical Care.47 Candidates for the study’s population were all high-risk patients in need of CABG surgery. The objective was to prove that ECMO is a viable option to act as a bridge before a large operation. Among their population 100 % received a successful ECMO insertion and 83 % of patients lived the next 6 months’ event free. The ECMO is a very useful percutaneous device that in some cases can provide a chance for survival or at least a bridge to a definitive treatment. Much research is required before it is clear whether this device reduces mortality. Despite large, randomized trials failing to show superiority of one device over the other, the IABP seem to be falling out of favor with most interventionalists due to expanding registry data and substudy analysis showing promise in Impella. IABP’s lower CO augmentation (up to 0.5 l/min) and need for regular rhythm are major limitations. With ECMOs being largely managed by the surgeons and the need for septal perforation for TandemHeart placement, Impella offers better CO augmentation compared with IABP, and easier placement compared with TandemHeart. 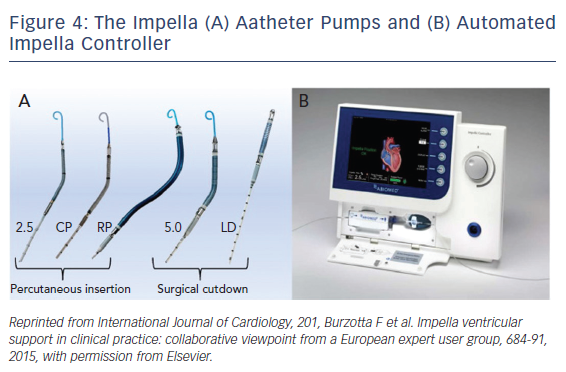 However, Impella is a relatively new device that has a learning curve compared with more established devices as suggested by a substudy analysis of PROTECT II trial.48 Also, technical support and troubleshooting are other considerations when prolonged support is needed. ECMO and TandemHeart have different roles in specific scenarios. Device choice depends on many factors including: patient’s profile (Table 1), nature of procedure (e.g. critical STEMI PCI versus elective high-risk PCI), time limitations, anticipated degree for hemodynamic compromise, anticipated duration of support, availability of the device, interventionalist’s experience with the device, and availability of resources for post-placement management. There is still much data to be collected and analyzed to determine the best choices in specific clinical scenarios. Each operator and center must determine their needs and skillsets in the setting of current evidencebased data. Clearly, patients benefit from the hemodynamic support in critical cases, whether planned or emergent. Ease of use, cost, and availability of local expertise must also be considered in order to best serve our cardiovascular patients. Grüntzig A. Transluminal dilatation of coronary-artery stenosis. Lancet 1978;311:263. Rajani R, Lindblom M, Dixon G, et al. Evolving trends in percutaneous coronary intervention. Br J Cardiol 2011;18:73–6. Carnendran L, Abboud R, Sleeper LA, et al. Trends in cardiogenic shock: report from the SHOCK Study. Eur Heart J 2001;22:472–8. Babaev A, Frederick PD, Pasta DJ, et al. Trends in management and outcomes of patients with acute myocardial infarction complicated by cardiogenic shock. JAMA 2005;294:448–54. Menon V, Hochman JS, Stebbins A, et al. Lack of progress in cardiogenic shock: lessons from the GUSTO trials. Eur Heart J 2000;21:1928–36. Nanas JN, Moulopoulos SD. Counterpulsation: historical background, technical improvements, hemodynamic and metabolic effects. Cardiology 1994;84:156–67. Parissis H, Graham V, Lampridis S, et al. IABP: history-evolutionpathophysiology- indications: what we need to know. J Cardiothorac Surg 2016;11:122. Cao J, Liu W, Zhu J, Zhao H. Risk factors and clinical characteristics of in-hospital death in acute myocardial infarction with IABP support. Int J Clin Exp Med 2015;8:8032–41. Siriwardena M, Pilbrow A, Frampton C, et al. Complications of intra-aortic balloon pump use: does the final position of the IABP tip matter? Anaesth Intensive Care 2015;43:66–73. Tanaka A, Tuladhar SM, Onsager D, et al. The subclavian intraaortic balloon pump: a compelling bridge device for advanced heart failure. Ann Thorac Surg 2015;100:2151–7. Nowak-Machen M, Hilberath JN, Rosenberger P, et al. Influence of intraaortic balloon pump counterpulsation on transesophageal echocardiography derived determinants of diastolic function. PloS One 2015;10:e0118788. Poirier Y, Voisine P, Plourde G, et al. Efficacy and safety of preoperative intra-aortic balloon pump use in patients undergoing cardiac surgery: a systematic review and meta-analysis. Int J Cardiol 2016;207:67–9. Pöss J, Köster J, Fuernau G, et al. Risk stratification for patients in cardiogenic shock after acute myocardial infarction. J Am Coll Cardiol 2017;69:1913–20. Kirklin JK, Naftel DC. Mechanical circulatory support. Circ Heart Fail 2008;1:200–5. Baldwin RT, Radovancˇ evic´ B, Duncan JM, et al. Management of patients supported on the Hemopump cardiac assist system. Tex Heart Inst J 1992;19:81–6. Dixon SR, Henriques JP, Mauri L, et al. A prospective feasibility trial investigating the use of the Impella 2.5 system in patients undergoing high-risk percutaneous coronary intervention (The PROTECT I Trial): initial US experience. JACC Cardiovasc Interv 2009;2:91–6. O’Neill WW, Kleiman NS, Moses J, et al. A Prospective, Randomized Clinical Trial of Hemodynamic Support With Impella 2.5 Versus Intra-Aortic Balloon Pump in Patients Undergoing High-Risk Percutaneous Coronary Intervention: The PROTECT II Study. Circulation 2012;126(14):1717–27. Dangas GD, Kini AS, Sharma SK, et al. Impact of hemodynamic support with Impella 2.5 versus intra-aortic balloon pump on prognostically important clinical outcomes in patients undergoing high-risk percutaneous coronary intervention (from the PROTECT II randomized trial). Am J Cardiol 2014;113:222–8. Henriques JP, Ouweneel DM, Naidu SS, et al. 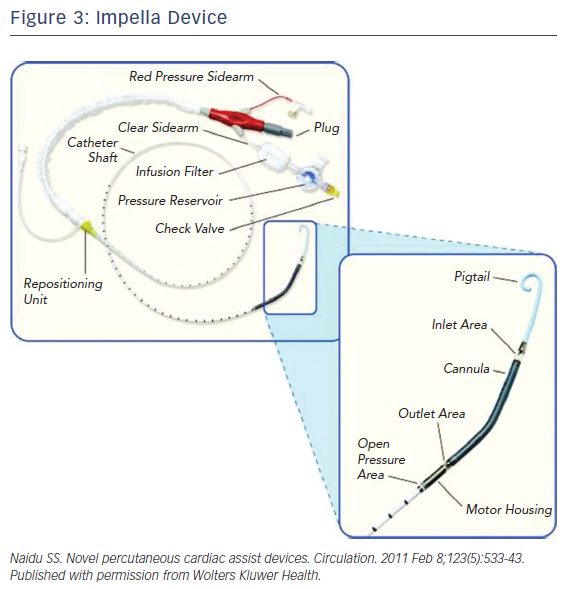 Evaluating the learning curve in the prospective randomized clinical trial of hemodynamic support with Impella 2.5 versus intra-aortic balloon pump in patients undergoing high-risk percutaneous coronary intervention: a prespecified subanalysis of the PROTECT II study. Am Heart J 2014;167:472–9. Kovacic JC, Kini A, Banerjee S, et al. Patients with 3‐vessel coronary artery disease and impaired ventricular function undergoing PCI with Impella 2.5 hemodynamic support have improved 90‐day outcomes compared to intra-aortic balloon pump: a sub-study of the PROTECT II trial. J Interv Cardiol 2015;28:32–40. Kahaly O, Boudoulas KD. Percutaneous left ventricular assist device in high risk percutaneous coronary intervention. J Thorac Dis 2016;8:298–302. Flaherty MP, Pant S, Patel SV, et al. Hemodynamic support with a microaxial percutaneous left ventricular assist device (Impella) protects against acute kidney injury in patients undergoing high-risk percutaneous coronary intervention. Circ Res 2017;120:692–700. Meraj PM, Doshi R, Schreiber T, et al. Impella 2.5 initiated prior to unprotected left main PCI in acute myocardial infarction complicated by cardiogenic shock improves early survival. J Interv Cardiol 2017;30:2562–63. Seyfarth M, Sibbing D, Bauer I, et al. A randomized clinical trial to evaluate the safety and efficacy of a percutaneous left ventricular assist device versus intra-aortic balloon pumping for treatment of cardiogenic shock caused by myocardial infarction. J Am Coll Cardiol 2008;52:1584–8. O’Neill WW, Schreiber T, Wohns DH, et al. The current use of Impella 2.5 in acute myocardial infarction complicated by cardiogenic shock: results from the USpella Registry. J Interv Cardiol 2014;27:1–11. Joseph SM, Brisco MA, Colvin M, et al. Women with cardiogenic shock derive greater benefit from early mechanical circulatory support: an update from the cVAD registry. J Interv Cardiol 2016;29:248–56. Spiro J, Venugopal V, Raja Y, et al. Feasibility and efficacy of the 2.5 L and 3.8 L Impella percutaneous left ventricular support device during high‐risk, percutaneous coronary intervention in patients with severe aortic stenosis. Catheter Cardiovasc Interv 2015;85:981–9. Spiro J, Venugopal V, Raja Y, et al. Feasibility and efficacy of the 2.5 L and 3.8 L impella percutaneous left ventricular support device during high-risk, percutaneous coronary intervention in patients with severe aortic stenosis. Catheterization and Cardiovascular Interventions 2015 May 1;85(6):981–9. Khalife WI, Kar B. The TandemHeart® pVAD™ in the treatment of acute fulminant myocarditis. Texas Heart Institute Journal 2007;34(2):209. Thiele H, Sick P, Boudriot E, et al. Randomized comparison of intra-aortic balloon support with a percutaneous left ventricular assist device in patients with revascularized acute myocardial infarction complicated by cardiogenic shock. European heart journal 2005 Feb 25;26(13):1276–83. Cheng JM, den Uil CA, Hoeks SE, et al. Percutaneous left ventricular assist devices vs. intra-aortic balloon pump counterpulsation for treatment of cardiogenic shock: a meta-analysis of controlled trials. European heart journal 2009 Jul 18;30(17):2102–8. Kolobow T, Bowman RL. Construction and evaluation of an alveolar membrane artificial heart-lung. Trans Am Soc Artif Intern Organs 1963;9:238–43. Zapol WM, Snider MT, Hill JD, et al. Extracorporeal membrane oxygenation in severe acute respiratory failure: a randomized prospective study. JAMA 1979;242:2193–6. Smedira NG, Moazami N, Golding CM, et al. Clinical experience with 202 adults receiving extracorporeal membrane oxygenation for cardiac failure: survival at five years. J Thorac Cardiovasc Surg 2001;122:92–102. Peek GJ, Mugford M, Tiruvoipati R, et al. Efficacy and economic assessment of conventional ventilatory support versus extracorporeal membrane oxygenation for severe adult respiratory failure (CESAR): a multicentre randomised controlled trial. Lancet 2009;374:1351–63. Davies A, Jones D, Bailey M, et al. Extracorporeal membrane oxygenation for 2009 influenza A(H1N1) acute respiratory distress syndrome. JAMA 2009;302:1888–95. Zangrillo A, Biondi-Zoccai G, Landoni G, et al. Extracorporeal membrane oxygenation (ECMO) in patients with H1N1 influenza infection: a systematic review and meta-analysis including 8 studies and 266 patients receiving ECMO. Crit Care 2013;17:R30. Zangrillo A, Landoni G, Biondi-Zoccai G, et al. A meta-analysis of complications and mortality of extracorporeal membrane oxygenation. Crit Care Resusc 2013;15:172–8. García-Carreño J, Sousa-Casasnovas I, Díez-Delhoyo F, et al. Vein thrombosis after ECMO decannulation, a frequent and sometimes missed complication. Int J Cardiol 2016;223:538–39. Thiagarajan RR, Brogan TV, Scheurer MA, et al. Extracorporeal membrane oxygenation to support cardiopulmonary resuscitation in adults. Ann Thorac Surg 2009;87:778–85. Hemmila MR, Rowe SA, Boules TN, et al. Extracorporeal life support for severe acute respiratory distress syndrome in adults. Ann Surg 2004;240:595–605. Brodie D, Bacchetta M. Extracorporeal membrane oxygenation for ARDS in adults. N Engl J Med 2011;365:1905–14. Chiu R, Pillado E, Sareh S, et al. Financial and clinical outcomes of extracorporeal mechanical support. J Card Surg 2017; 32:215–21. Tomasello SD, Boukhris M, Ganyukov V, et al. Outcome of extracorporeal membrane oxygenation support for complex high-risk elective percutaneous coronary interventions: a single-center experience. Heart Lung 2015;44:309–13.